A new Gallup poll shows that Americans are more likely to think that there is too much regulation than too little. 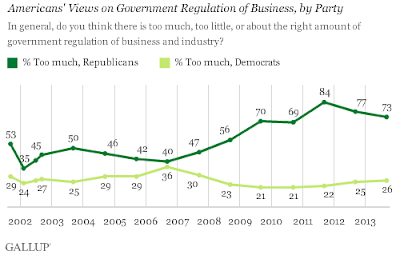 In 2008, 38 percent thought there was too much regulation and 27 percent thought that there was too little. Now that gap has grown to 48 to 23 percent. 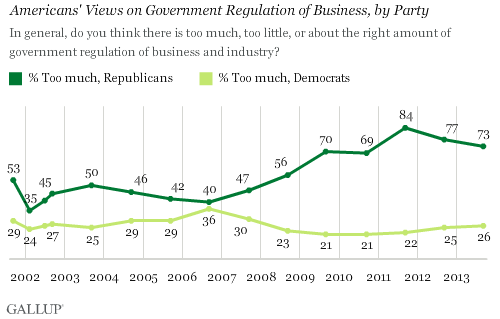 Even Democrats are slightly more likely to say that there is too much regulation compared to 2008, though during the Bush administration they were more likely to think that there was too much regulation.